First Line: "Is he dead?" Traveling secretary Hattie Davish is pleased to be in Galena, Illinois, and back working for her wealthy employer, Sir Arthur Windom-Greene. Hattie is helping Sir Arthur with his definitive biography of Civil War General Cornelius Starrett. What shocks the pair is the fact that even though forty years have passed, old wounds from that terrible conflict are still very raw. But Hattie has her hands full helping Sir Arthur with his book and getting the house ready for Christmas. She's never been in charge of Christmas preparations, so she's very excited and anxious to do the best job possible. She may not have much time to deck the halls; however, when General Starrett's belligerent son Henry is murdered and one of the main suspects is Sir Arthur himself. 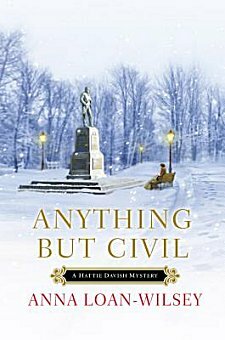 I really enjoyed Loan-Wilsey's first Hattie Davish mystery, A Lack of Temperance, but I have to admit that I had a more difficult time getting into Anything But Civil. This is mostly due to the fact that I intensely disliked two of the characters. Henry Starrett was a pompous, spoiled bully who found little reason to rein in his horrible temper. He was so obnoxious that I simply didn't care who killed him because Henry's absence was such a relief. Another character who drew my ire was Rachel Baines, a vain, ill-tempered sort of woman who feels better about herself by constantly putting others down. Henry and Rachel are two sorts of people whom, if I met them in real life, I would walk away-- and stay away-- from. Since they are prominent characters with many scenes, it was tough going at times. But I still think the character of Hattie Davish is a winner. She's smart, hard-working, quick-thinking and brave, and I enjoy watching her piece together clues to solve the crime. Getting acquainted with Hattie's oft-mentioned employer, Sir Arthur Windom-Greene, was a treat as well. He's an interesting blend of scholar, forward thinker, and proper upper class British gentleman. Also tops on my enjoyment scale is the setting of Galena, Illinois. The author made a very good decision to set her book in the hometown of Ulysses S. Grant. What better place to show the lingering aftereffects of the Civil War than in the home of the best-known of the Union generals? Although two obnoxious characters did dim my enjoyment of Hattie Davish's second mystery, I like her so much that I'm looking forward to her next adventure. Cathy - That just goes to show you how important the way we feel about characters is in terms of whether we enjoy a given book. If we like the characters, we are much more likely to be draw into the book. I do like historical series, though. I oughta try this series.